In most designs, the major cost of a Crystal Chandelier is the price of the Crystal components. The quantity and shapes of the Crystal utilized to trim the Chandelier and most importantly, as in grades of diamonds, the Crystal quality determines the price. Many of our Chandeliers are available in up to FIVE QUALITIES of Crystal Trim. James R Moder® Crystal offers its highest quality Chandeliers (-00), trimmed with 100% Brilliant Swarovski® crystals (previously known as STRASS® and ELEMENTS), manufactured in Austria. Color Crystal options are also available in Swarovski® crystals. 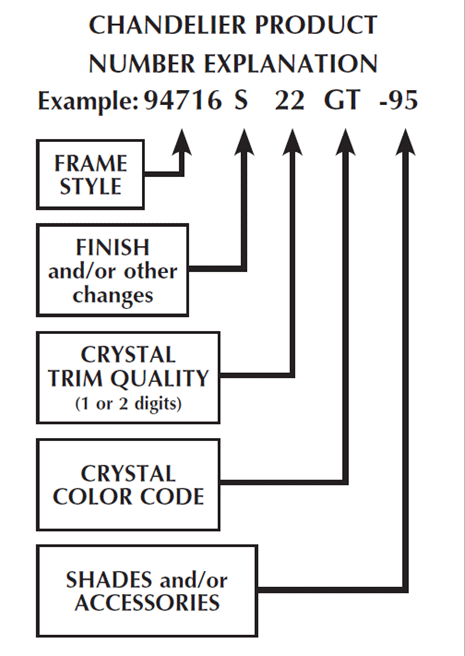 James R Moder® Crystal offers at a lower cost (-11), SPECTRA® CRYSTAL by Swarovski®, an alternative high quality Crystal trim. These Crystal Chandeliers are trimmed with 100% SPECTRA® CRYSTAL by Swarovski® components, manufactured in Austria. James R Moder® Crystal offers IMPERIAL™ Crystal trim (-22), which blends a quality look with a great price point. These Crystal Chandeliers are trimmed with a combination of high Crystal qualities from some of these Crystal sources: Austria, Czech Republic, Egypt, and Crystal from other sources. Color Crystal options are also available in IMPERIAL™ Crystals. James R Moder® Crystal can provide BUDGET Crystal trim (-33) for large projects and specialty-ordered large Crystal Chandeliers where budget price is critically important. James R Moder® Crystal's exclusive REGAL™ Hand-cut and Polished Crystal (-44) is still requested by connoisseurs of Crystal on a Custom basis. These Crystals are hand-cut and polished by artisans in EUROPE and around the world. This and other Crystal, such as ROCK crystal, are available by special customer request. James R Moder® Crystal offers various crystal color options.